Their families are poor and do not know what IIT is, but these children dream of IIT and working for ISRO and NASA one day. One man and his family have helped 333 such children turn their dreams to reality. As Bihar goes to the polls, Archana Masih/Rediff.com salutes its greatest success story. In a narrow, ordinary lane, running by the side of a railway track in Patna, lives an extraordinary man. The neighbourhood has several slender gullies and his house stands at the end of one. It is called Shanti Kutir, named after his dadi, where he stands on the verandah in a t-shirt, shorts and chappals. "Namaste, swagat hai aapka (Namaste, welcome)," says Anand Kumar, undoubtedly one of India's greatest teachers, who tutors underprivileged children free of cost for the IIT entrance examination with tremendous success. Anand Kumar's Super 30 has attained legendary status. In the 12 years since it began, 333 poor students have passed the IIT entrance exam. When he began in 2003, 18 students had been successful; since then, most among the entire batch of 30 students have made it to the IITs year on year. 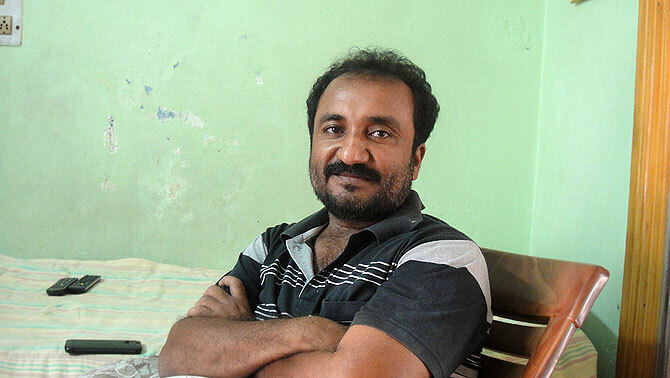 IMAGE: Anand Kumar is a mathematician who has been tutoring underprivileged kids to clear the IIT-JEE. It is a hot Saturday morning and the students have been given a week's holiday for Durga Puja. This group of 30 only has boys. There have been 15 to 17 girls in past years that have been successful in passing the IIT-JEE. The last batch had one girl, Nidhi Jha, who stayed with Anand Kumar's family while the boys reside in a rented hostel nearby. She was the daughter of an autorickshaw driver and featured in a French documentary for her wonderful achievement. Nidhi is now studying at the Indian School of Mines. Another girl, Pragya Verma, went to IIT-Bombay and is now at the University of Minnesota. Abhishek Raj -- whose mother laboured to supplement the household income to pay for the notebooks, pencils of her children at the government school -- went to IIT-Kharagpur, then to the US and is now in England. Shashi Narayan, the son of a hospital worker in a government hospital, who won the Erasmus Mundus scholarship for research in France, has recently taken up a teaching position in England. Their tutor sits opposite me and speaks about his graduates with pride. "I had got admission in Cambridge, but could not go because we did not have the money," he says, "Par mere students mere sapney mein rang bhar de rahe hai (My students are fulfilling my unrealised dreams)." IMAGE: Boys in the current Super 30 batch. Thirty children are selected after an entrance exam. 333 have cracked the IIT-JEE so far. While I have talk to Mr Kumar, he briefly leaves the room and returns with a cup of tea that he has made himself. I tell him he shouldn't have taken the trouble and he says it was no problem at all -- he didn't want to trouble the ladies of his home who are busy with something else. His wife Ritu is an alumnus of IIT-Roorkee and helps the students with their notes and scholarship applications. They have a little boy who recites a poem about how voters should not vote under duress or bribe but with their own clear conscience. Some students from his current batch sit in the next room. They have trains or buses to catch in a few hours that will take them to their homes for the short holiday. They are shy, simple, boys who sit on a bed in a room full of framed citations for Super 30 and Anand Kumar. This is where they come for their classes every morning from their hostel which is a short walk away. The classes are conducted by Mr Kumar and two other tutors, while the administration is looked after by his younger brother Pranav. The meals are cooked in Mr Kumar's home by the ladies of the family and sent to the hostel. Till they found a rented space a few years back, the students lived in the same house, while Mr Kumar's mother cooked for them all. 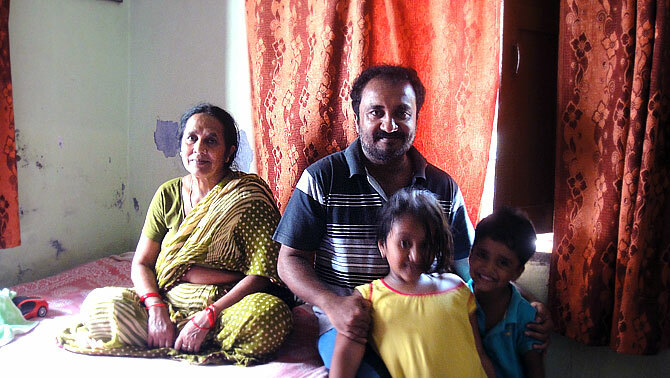 IMAGE: Anand Kumar with his mother, who along with other ladies of the family, cooks for the 30 boys. "Getting into Super 30 is very difficult. It is like breaking a matka with a kankar (grain of sand)," says Rohit Kumar, a graduate who has come to visit. Rohit bears the confidence that a college campus in a city instills in students. The four village boys who sit with him and are in the current batch have a raw innocence about them. Two of them say their parents don't know what IIT is. One of them is also called Anand Kumar. The other is Basant Kumar. They are both 17. "No one in my family knows about IIT. 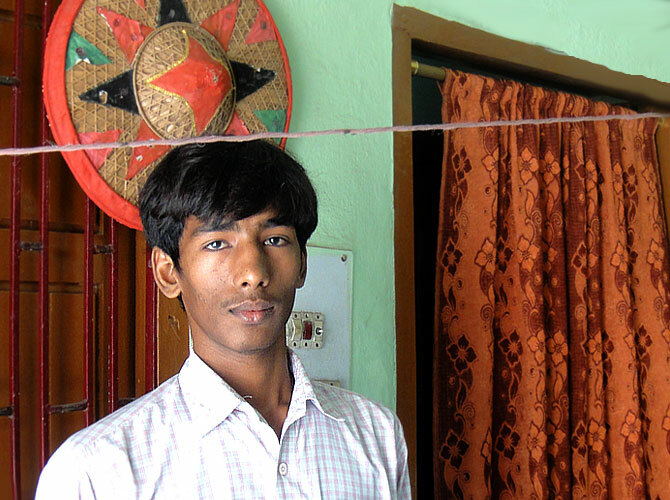 I want to do computer science and then do something for the country," says Anand, the son of a farmer from Gorakhpur. Sitting cross-legged in a pink checked shirt opposite him is Basant, the son of a farmer from Maniyar Bigha village near Gaya. "No one knows what IIT is in my home either. I had read about Super 30 in a newspaper, filled the form and sat for the entrance test in Patna," says the lad who wants to first get a good rank and hopes to join ISRO or NASA. All the four boys sitting with me are from government schools. I ask them how good was the teaching and they say there were one or two teachers who taught well, while most of the studies, they had done on their own. They had no tuition, no extra classes. Getting a seat in Super 30 was unbelievable and introduced them to a whole new world of study. "I have never studied math like what Anand Sir teaches us," says Manjit Kumar from Gurmia village. 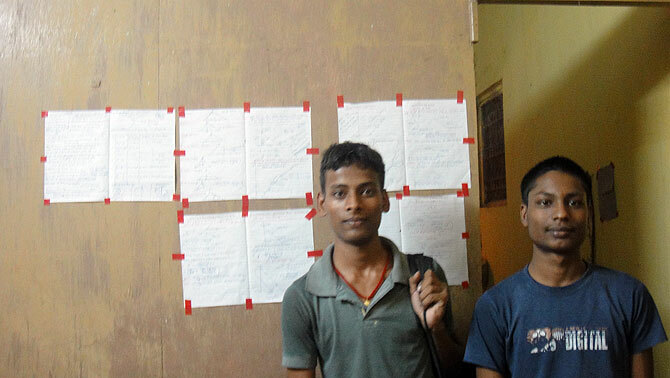 IMAGE: Manjit and Anand stand in front of their pasted study notes in the hostel. Basant, who is getting late for his bus, excuses himself politely, but before rushing out, says, "If I had a dream within a dream, I could never have dreamed that I would be in Super 30. I can't even say this is a dream come true because I never had such a big dream." The boys are sitting with their bags, some have bottles of water. Anand and Manjit haven't decided whether they should go home. Their studies will get hampered at home, they say, and they cannot afford it. I ask them to take me to their hostel and on the way Manjit tells me that he has decided not to go home. His books are kept in a bamboo rack left behind by a student from the last batch. Physics equations written by hand are pasted on sheets of paper on the wall. The boys' stay, meals and coaching is free, but they pay for personal expenses like phone bill, books etc. They tell me they need around Rs 400 per month from their parents for their expenses. Not more, that is enough, says Anand. Mr Anand Kumar sustains his band of 30 from the money earned by providing coaching in the evening to those students who can afford it. He also plans to launch an online tutorial for a fee. Super 30 does not accept any donations. IMAGE: The boys each have a bed, study tables and keep their books around them. The boys take me around their modest rooms just as lunch time approaches. I ask Anand what he thinks is needed most in our country today. ""Good teachers," he says with the sincerity of a student who has experienced the shortcomings of our education system. One of the last things Mr Anand Kumar says before I left is this: "A good teacher is the harbinger of the biggest change. No neta can do what a teacher can." As the boys leave for the day, one by one they touch his feet. "People ask me to stand for election, but I feel the respect I get from my students I will never get as a neta." He takes me inside to introduce me to his mother whose hand-made papads he would sell house to house to buttress the family income in those early days. 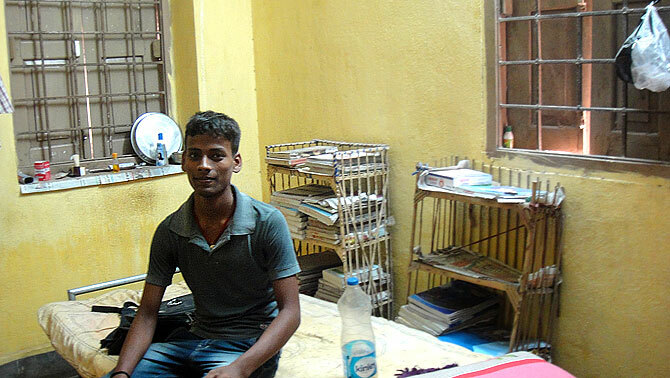 When he had started Super 30 a decade ago, this house where he conducts the classes and lives, was small. It is still not very large, but has a heart big enough to accommodate 30 bright minds each year -- and within its walls are some of our country's greatest success stories. Will Pakistan accept a beef-eating Indian who also eats pork?